Mauser project revisited, with a new spin! For a while now, I’ve had the urge of SBRing a Mauser, and cutting the barrel to 7″, turning it into an evil spirits defying flame-thrower/car alarm setter-offer. I started off with a shot out M38 Turkish Mauser, I had rescued from an ATI plastic sniper stock, and a sporterized 98K stock I found on eBay. After that, the project pretty much sat idle in my safe, awaiting time and money to continue. I decided to remove the shot out barrel from the receiver. I soaked the threads overnight with Mouse Milk, and heated a section of the barrel to red hot, about 6″ from the muzzle. Once the barrel was nice and hot, I bent the barrel 90 degrees, to ease the removal process. After carefully rigging the received in a vice, I added a cheater bar to the now 90 angled barrel, and broke the barrel free, easier as I had expected. Then, with the barrel removed, I cut the barrel down to 16.5″ so I could make a mock-up of the rifle with a 16.25 barrel. 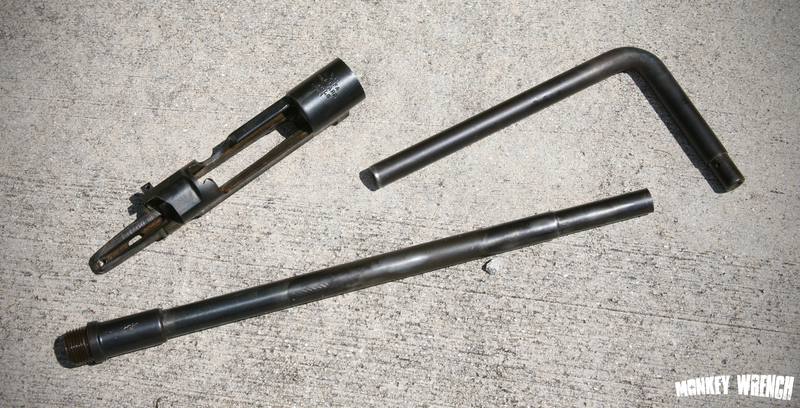 The barrel, removed from the receiver and cut to 16.5″. I still have to come up with a solution for a sight. I’m not sure if I will be installing original Mauser sights, or if I am going to run a small red-dot. The benefit of a red dot is that it will clear a suppressor at the muzzle.